I know this seems like weird advice, but stay with me. Most of us spend a great deal of time avoiding unpleasant thoughts or things we’d rather not face or accept about ourselves. If you’ve got nothing to write about, it could be because you’re devoting so much energy toward blocking these kind of ideas instead of thinking about what they really mean. There are a lot of ideas to be found for people who choose to face their fears. Songwriters aren’t musicians first and lyric-writers second. The stories in music end up being incredibly meaningful to listeners which means that you should do your best to write meaningful lyrics. 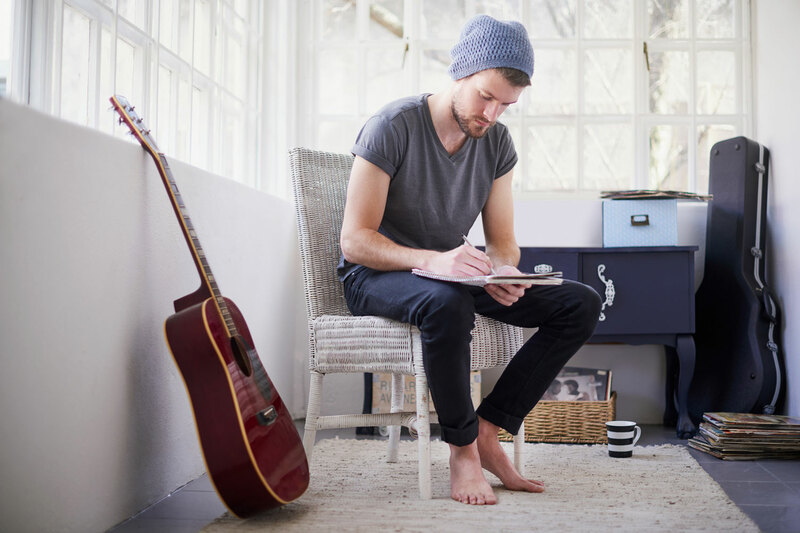 Because most songwriters aren’t experienced writers, many don’t know the value of free writing. Free writing is writing continuously without worrying about spelling, grammar, or the content of your written thoughts. It’s an exercise that can help unlock and inspire ideas in a person. All you need is your laptop or a pen and paper and a non-judgemental attitude to do this. Fictional storytelling is something that proves to be cathartic for many songwriters. Sometimes our own stories are too painful or complicated to tell in our music. If this is you, try writing a fictional story that honors your non-fictional feelings. It doesn’t haven’t to translate perfectly, but fiction is a great vehicle for lyrical ideas to play out when a songwriter doesn’t want to reveal things about their own life or when they simply have nothing real to write about. There’s no big great song rulebook that says everything we write music about has to make sense. If you can’t seem to eek out a song because the lyrics are never good or cohesive enough, try writing lyrics that make no sense or even gibberish. You might hate what you come up with or the exercise might be just what you need to relax and let ideas come to you naturally. Something that’s not talked about enough in music is the process of writing lyrics. Some writers start songs with lyrics, and others sing gibberish over chord progressions until something sensible emerges. I happen to be in the latter category and I find that concepts present themselves when I loosen up enough for them to emerge. Letting go of expectations and being ridiculous or even just singing nonsense over music are things that can show you a way forward when you’re hung up on writing lyrics. thank you – these tips make a lot of sense. I would add though that I am equal parts musician and lyricist. I love instrumental music and have written quite a bit of it. Sometimes the emotion in the right set of chords with an instrument on top can give me chills or lift me up every bit as much as a good lyric. I think these tips will help out a ton. The problem I’ve been having is not having any pain in my life at the moment, so I’m going to try to fiction route in the future to where people can relate. Great problem to have! But I agree, it is easier to write out of pain. I have recently tried to work more with elation (as in according it similar emotional weight) and it is gradually yielding results. But I’m finding taste a bit of a barrier. It’s harder to like songs in a major key! I think that marks me firmly as an amateur. Good luck to you. And a big one if you’re having trouble finding something to.l write about, CO-WRITE!!!! I think this is so important because it gives you more ideas and different perspectives. Many hit songs have been written by 2 or more writers. Great to read something like this that’s out of the box and not just work ethicky “keep your bum in the chair” kinda thaing. That just doesn’t work for fidgets and dilettantes! These all work for me. With no formal training, but excessive investment in learning the English language, I was surprised to find I have used all four concepts to pen lyrics. But, some of mest work has been facing my inner struggles and failures, or boasting about victories I have had great or small. While some of life experience can be painful, writing about it in journals, blogs, poems, or lyrics has shown to be deeply therapeutic and gratifying. Some of those less comfortable moments had birthed expression that would nit have come from other places in my thoughts or heart. I would encourage others to give time and place to temporal thought related to write about some of those experiences as well. It may lead to a platform of sharing, support, healing, and encouragement, or may be publicly regarded as a song without anyone needing to know the intimate details of your story. One may find there are stories yet to sing well worth being sung. I look around for easy-to-sing phrases and try to write around them. I will write them down on a slip of paper for future investigation.